Gray, Anthony W. 2018. Interventions in Pulmonary Medicine. p. 527. Kelly, J and Mahalingam, S 2015. Surgical treatment of head and neck cancers in the ancient world. The Journal of Laryngology & Otology, Vol. 129, Issue. 06, p. 535. Lima, A Mesquita, J Mega, AC and Nobrega, C 2011. How to apply a foot bandage. The Veterinary Nurse, Vol. 2, Issue. 8, p. 476. Gunasekera, Hasantha Morris, Peter S McIntyre, Peter and Craig, Jonathan C 2009. Management of children with otitis media: A summary of evidence from recent systematic reviews. Journal of Paediatrics and Child Health, Vol. 45, Issue. 10, p. 554. Stiefel, Marc Shaner, Arlene and Schaefer, Steven D. 2006. 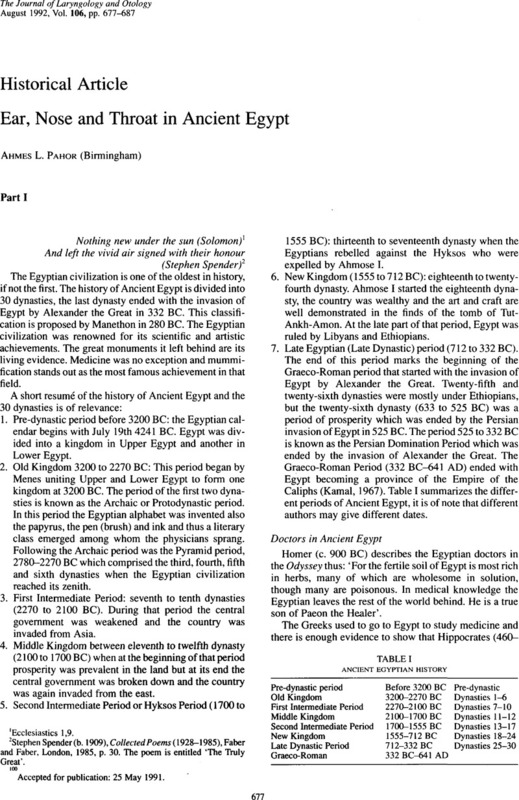 The Edwin Smith Papyrus: The Birth of Analytical Thinking in Medicine and Otolaryngology. The Laryngoscope, Vol. 116, Issue. 2, p. 182. Sipos, Péter Gyõry, Hedvig Hagymási, Krisztina Ondrejka, Pál and Blázovics, Anna 2004. Special wound healing methods used in ancient Egypt and the mythological background. World Journal of Surgery, Vol. 28, Issue. 2, p. 211. Lustig, Lawrence R. 2004. The history of intratympanic drug therapy in otology. Otolaryngologic Clinics of North America, Vol. 37, Issue. 5, p. 1001. Gamatsi, Irene E Nikolopoulos, Thomas P and Lioumi, Dimitra E 2003. The ear and its malformations: strange beliefs and misconceptions. British Journal of Plastic Surgery, Vol. 56, Issue. 4, p. 369. Pahor, Ahmes L 2003. Pharaonic ORL. International Congress Series, Vol. 1240, Issue. , p. 1349. Fraise, Adam P Pahor, Ahmes L and Beswick, Alan J 2001. Otitis media with effusion: the role ofAlloiococcus otitidis. Annals of Medicine, Vol. 33, Issue. 1, p. 1. De Smet, Peter A.G.M. 1998. Traditional pharmacology and medicine in Africa. Journal of Ethnopharmacology, Vol. 63, Issue. 1-2, p. 1. Sullivan, Richard 1996. The identity and Work of the Ancient Egyptian Surgeon. Journal of the Royal Society of Medicine, Vol. 89, Issue. 8, p. 467. Address for correspondence and reprints: Ahmes L. Pahor, M.A., D.M.Sc. (Path), F.R.C.S., D.L.O., Consultant ENT Surgeon, Dudley Road Hospital, P.O. Box 293, Birmingham B18 7QH.